Fifteen-year-old Eleanor Fromme just chopped off all of her hair. How else should she cope after hearing that her bully, James, has taken his own life? When Eleanor’s English teacher suggests students write letters they’ll never send, Eleanor writers to James. With each letter she writes, Eleanor discovers more about herself, even while trying to make sense of his death. And, with the help of a unique cast of characters, Eleanor not only learns what it means to be inside a body that does not quite match what she feels on the inside, but also comes to terms with her own mother’s mental illness. 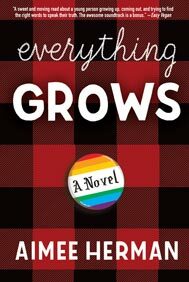 Told through a series of letters and set against a 1993-era backdrop of grunge rock and riot grrl bands, EVERYTHING GROWS, by Aimee Herman, depicts Eleanor’s extraordinary journey to solve the mystery within her and feel complete. Along the way, she loses and gains friends, rebuilds relationships with her family, and develops a system of support to help figure out the language of her queer identity. Through author Aimee Herman’s exceptional storytelling, EVERYTHING GROWS reveals the value of finding community or creating it when it falls apart, while exploring the importance of forgiveness, acceptance, and learning how to survive on your own terms. Aimee Herman is a two-time Pushcart Prize-nominated novelist, poet, and performance artist based in Brooklyn, looking to disembowel the architecture of gender and what it means to queer the body. Aimee is the author of two poetry collections, to go without blinking (BlazeVOX books) and meant to wake up feeling (great weather for MEDIA). 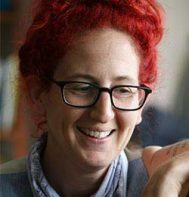 Her work has been widely published in the U.S. and internationally in literary journals including Lavender Review, EDUCE, Sous Les Pave, and the Lambda Award-winning anthology Troubling the Line: Trans and Genderqueer Poetry and Poetics (Nightboat Books). Aimee currently teaches at Bronx Community College. She sings and plays ukelele in the poetryband Hydrogen Junkbox.